Is this the way of the future? Image via Shweeb. Google finally announced the winners of its Project 10100, awarding $10 million to five organizations that have ideas to help change the world. People from more than 170 countries submitted more than 150,000 ideas, which Google narrowed down to 16 big ideas, open to public voting for the selection of the final five winners. “I first had the idea of a pedal powered urban transport system nine years ago. I’ve always loved riding a bike but I don’t like getting rained on, and I don’t like punctures! I realized that if you mixed a recumbent bicycle with a monorail, you’d get an incredibly efficient machine that you could ride through a city at high speed in complete safety…. The existing Shweeb prototype is more of a rollercoaster ride than a transit line. The original “adventure ride concept system” is located at Agroventures Park, designed for amusement seekers, in Rotorua, New Zealand. To PRT or not to PRT? While the idea of adapting “a thrilling and innovative riding experience” to an urban setting is exciting (the Agroventures Park Shweeb ride can reach “up to 45 kilometers per hour and 60-degree swings on the bends,”) it seems wasteful to seriously consider this technology as an “innovation” in public transportation, when there are so many other low-hanging-fruit solutions to improve the way people move around in cities. Just considering the dollar cost per kilometer of infrastructure, the Shweeb seems less financially responsible than simply building more (or better) bike lanes, sidewalks or bus corridors — all of which are relatively low-cost. Yes, the Shweeb would be cheaper than building a new metro or light rail system, but it still requires significant infrastructure to move just one person (or up to four people) at a time. Why not fund high-quality articulated buses that can transport a couple hundred passengers? If existing bus systems are costly, why not figure out ways to make them more economical, rather than creating a new type of mass transit? Or, if last-mile connectivity is the problem, why not invest in something like city-wide, high-tech, well-branded bike-sharing systems? From a social perspective, the Shweeb is less interactive and communal that other transit modes. How much more isolated can we get, suspended in enclosed pods, watching vibrant street life whizzing by? And there are other constraints and concerns about the project. What are the costs of maintenance? Won’t these systems compete with existing mass transit programs for limited riders and money? Hopefully, these and other issues will be discussed at the upcoming 4th Podcar City Conference (PCCC4) on October 27-29, 2010 in San Jose, Calif.
At the end of the day, the Google-funded Shweeb is finally helping to fulfill the dream of Google co-founder Larry Page, who said he always wanted to build a “futuristic” personal rapid transit (PRT) system, ever since he was a student at the University of Michigan. There’s already a proposal by U.K.-based company ULTra PRT to connect Google Mountain View campus, NASA and Caltrain in California with this type of “circulator transit.” In a setting like that, where private dollars are abundant and communities are neatly enclosed, a PRT system may be worth the investment. 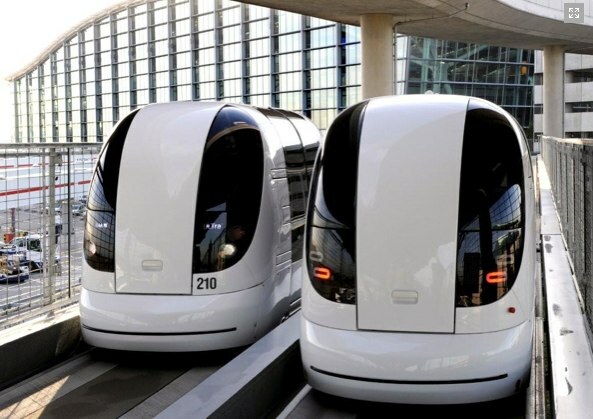 The idea of driverless pod-like cars is certainly gaining popularity in some cities. High-profile projects like the world’s first commercial PRT system, also built by ULTra PRT, opened with much fanfare at Terminal 5 of London’s Heathrow Airport. (“The event was marked with the vehicle bursting through a paper screen before parking itself in the dedicated bay.”) Airport operator BAA Ltd. estimates the PRT system will save 40 percent in costs over existing bus service, according to The New York Times. And it will also be 50 percent more energy efficient than traditional buses, according to a Heathrow press release. What do you think? Is this the way of the future? Two vehicles run on the guideway of London Heathrow's Terminal 5 for the first time. Photo via ULTra PRT.